I JUST got my first kayak last night. I live in Sultan, Washington - which is right on hwy 2 off the Skykomish and Sultan rivers. I just signed up to the Washington Kayak Club. 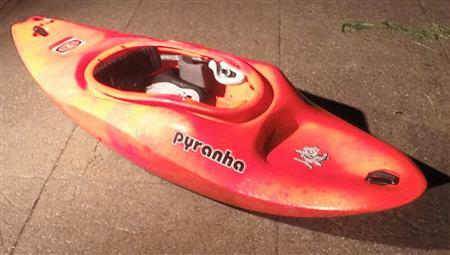 I just got a Pyranha S8 play kayak on craigslist in Leavenworth for $150 and could not be more thrilled. The sum total of my kayaking experience thus far is sitting in this kayak on dry land for about 5 minutes. I'm immediately looking into roll classes in the area and learning all I can. I know this is not exactly an ideal first-timer type kayak but I am sort of an extreme sport enthusiast in many sports and just thought I would this time skip all the beginner gear for this sport and go right to what my goal vessel would be even if the learning is more challenged. My prior sports include windsurfing, skiing/snowboarding, waterskiiing. Presently I do a lot of mountain unicycling, and salmon fishing in the local areas. But I have ALWAYS wanted to do whitewater kayaking, and love the surf and play kayaking - hope to do that soon after I learn to paddle. HAA HAA No seriously, I will be working on getting roll skills down ASAP and won't push my way into whitewater before then. Probably will work on them in indoor pools to start - with some support.